Couscous is a staple in most Maghreb cuisines. 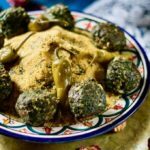 It is known as the national dish in Tunisia, but also in Algeria and Morocco, as well as Mauritania and Libya. 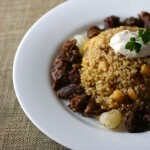 Tunisian couscous is one of the countless variations of this delicious and versatile dish. It is thought that the original name of couscous (Arabic: كسكس) could have come from the Arabic word kaskasa, which means “to pound in small pieces” or from the Berber word seksu, which means “rounded” or “well rolled”. 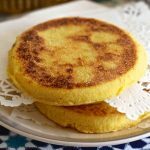 It is called kousksi in Tunisia, taam, kosksi or kesksu in Algeria, seksu in Morocco, and maftoul in Jordan and Lebanon. It is also used in Sicily where it is known as cuscusu. Couscous is made from small durum semolina balls that are crushed and steamed. Where does couscous come from? The origin of couscous is not very clear. It is thought that it might have been invented by the Berbers, as early as the 3rd century AD. Primitive couscous steamers dating from the reign of the Berber king Massinissa were found in Algeria. Other sources say that couscous was born between the end of the Zirid dynasty (Berber dynasty from central Maghreb) and the beginning of the Almohad caliphate around the twelfth century. Other historians have proved that the method of cooking couscous, which consists of cooking the semolina over water or broth, in a special pot (couscoussier), may date back to the 10th century and could have started in the West African regions of the Kingdom of Sudan, today’s Niger, Mali, Mauritania, Ghana and Burkina Faso. Even today, in parts of Guinea and Senegal, recipes that are based on millet couscous with meat or peanut sauce are still popular. In the 13th century, a Syrian historian from Aleppo referred to couscous in his work, confirming that couscous had spread fairly quickly, mainly from the former Libyan province of Tripolitania to the west. Couscous is also popular in West Africa, as well as in Central Africa, and has even spread to the southern Turkish provinces from Syria around the sixteenth century. Note that couscous was originally prepared with millet and not wheat. Most historians believe that the transition to wheat occurred in the 20th century, although there are still many areas that use millet to make couscous. Couscous is traditionally steamed in a couscous steamer (couscoussier) to produce softer, larger grains. Nowadays, the couscous grain (semolina) that is sold in most supermarkets in the western world is pre-steamed and then dried. Precooked couscous, also known as instant couscous, takes less time to prepare than traditional couscous, and is almost as good, although purists will easily notice the difference. Couscous is also the name of the recipe made with the semolina of the same name. 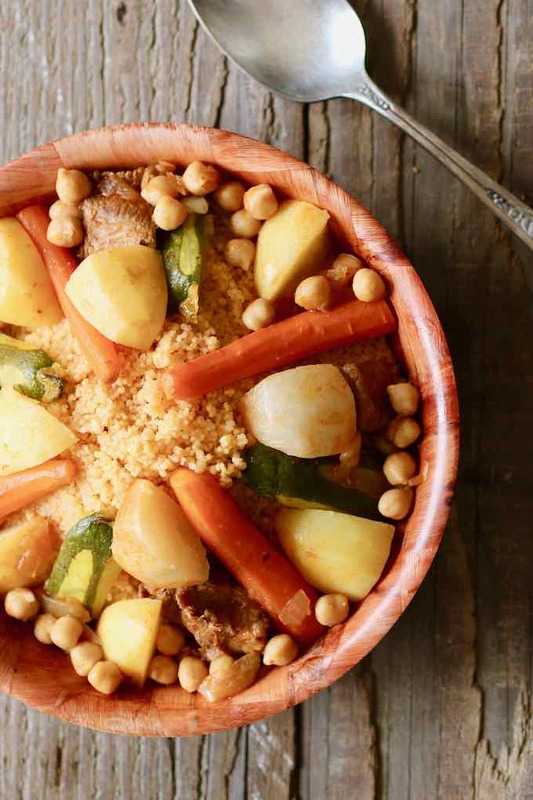 There are a multitude of couscous recipes, including vegetarian, meat (beef, lamb, etc), chicken, fish, seafood and even butter couscous (couscous au beurre). The version I am sharing today is the Tunisian version. There are also as many versions as families or regions in Tunisia! 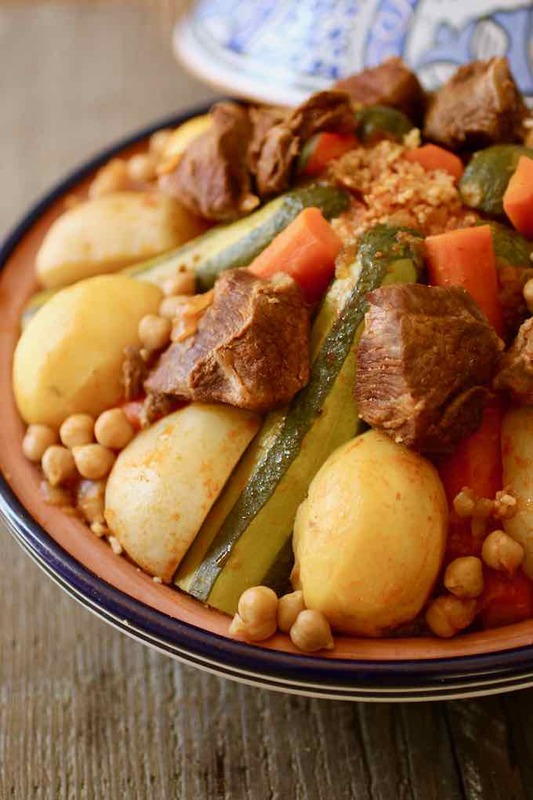 However, Tunisian couscous has some characteristics that differentiate it from Algerian and Moroccan couscous. First, the Tunisian couscous sauce is always red, because of the tomato or tomato sauce that is used. The “white” sauce, which is often used in Algerian couscous (in areas not close to the Tunisia border), does not include tomatoes, but rather spices such as cinnamon. While white sauce couscous can be found in Algeria and Morocco, there is hardly any in Tunisia. 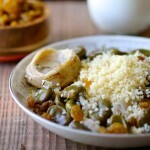 In Morocco, there are also more sweet versions such as couscous seffa, a couscous dish with almonds and raisins or couscous tfaya with caramelized onions and raisins. 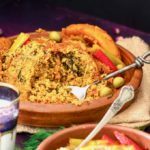 Among the Tunisian versions, we find the couscous barbouche, a typical dish of southern Tunisia, prepared with tripe and herbs (cilantro, parsley), and served traditionally with hard-boiled eggs. The couscous with grouper (couscous au mérou) is a couscous with the typically Tunisian fish which you can also find in Sicily. The fish couscous, or sékssou bel hout (سكسو بالحوت), is a traditional couscous of the region of Sfax in Tunisia, but also from Moroccan cities on the Atlantic coast. When preparing a meat couscous, it is important to choose only one meat. Indeed, the couscous is steamed with the vegetable and meat broth, and this broth should give the aroma of only one meat. 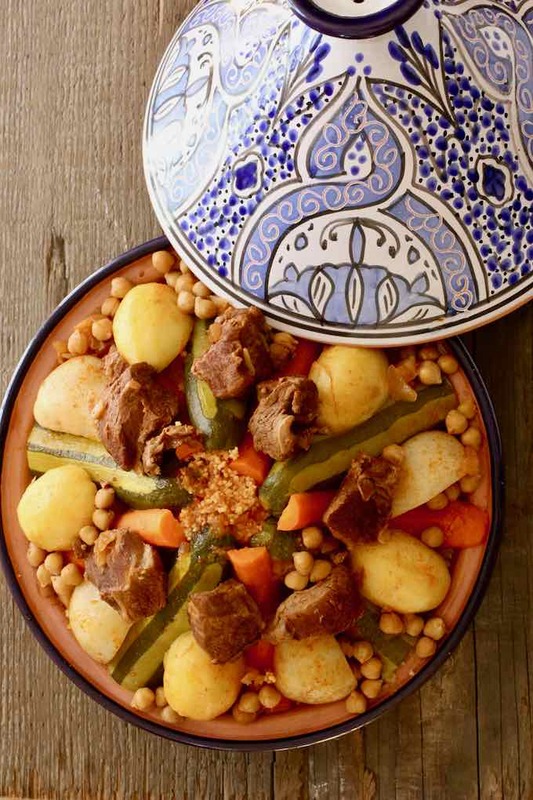 It is for this reason that the “couscous royal”, a French invention that generally includes several meats, is absolutely not traditional in the Maghreb. 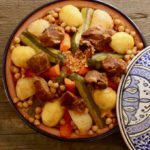 Some couscous recipes from North Africa add merguez, but most traditional couscous are prepared with only one meat. Couscous can also be prepared with several spices, and spice blends. In Tunisia, tabel is the preferred spice blend. It usually includes at coriander, caraway, garlic and chili powder at a minimum. There is also ras el hanout, a spice blend from the Maghreb whose recipes also vary but which often include spices such as cumin, ginger, turmeric, cinnamon or coriander. In Tunisian Jewish homes, the couscous that is prepared for Shabbat is often served with meatballs. These meatballs are quite unique and characteristic of Tunisian Jewish cuisine. My mother and my grandmother prepared them almost every Friday for our greatest pleasure. These meatballs are prepared with ground beef, stale bread (rehydrated), and various spices including crushed rose petals. Each oblong meatball is made with one piece of cut vegetable that may include potato, celery, zucchini or artichoke. They are breaded and then fried. They can be served as is or cooked slowly with the coucous broth. Since most people do not own a couscous steamer (couscoussier), I am sharing a couscous recipe where the couscous semolina is prepared separately instead of being steamed at the top of the double boiler. However, it is important to impregnate the semolina with the broth at least an hour before serving so that the semolina has time to absorb the aromas of the meat and vegetables broth. I prepared this Tunisian couscous for a dinner with our friend Skander and his wife Alevtyna. Skander, who is the director of the Los Angeles Conservatory of Music where our children learn violin and cello, is of Tunisian origin. It was a pleasure to host him to share our common heritage around this couscous. We started this Tunisian feast with a traditional kemia, including the ommek houria salad, and we finished with a harissa hloua and a sabayon, served with a tea with pine nuts of course! Tunisian couscous is one of the countless variations of this delicious and versatile North African dish, which consists of semolina served with a broth made with meat and vegetables. Pour ½ cup of oil into a large pan. Fry the onion over medium heat for 2 minutes. Add the garlic, tomato paste and harissa and continue frying for 2 minutes. Add the caraway, coriander, and chili powder. Mix and continue cooking for another 2 minutes. Add the lamb meat and mix well so that the pieces are covered with the sauce. Cook for 5 minutes stirring regularly. Cover with water. Add the turnips and carrots, and cook on low/medium heat for 45 minutes. Meanwhile, prepare the couscous semolina as indicated on the package, with boiling water, salt, and oil. After 45 minutes, add the zucchini, potatoes and chickpeas. Cook for at least another 30 to 40 minutes over low/medium heat. Monitor the cooking of the vegetables. If some vegetables are cooked before the meat, remove them from the pan and place them on a serving platter. Proceed in the same way with all the vegetables to prevent them from cooking too much. 10 minutes before the end of cooking, get a few ladles of broth (one at a time) and wet the couscous semolina. Mix the semolina well after each ladle until it get moistened enough. Arrange the semolina in a tajine pot. Decorate the dish with the vegetables and the meat all around. Garnish with fried green hot peppers (optional). Thank you for this recipe will definitely try a vegetarian version of it. Our family is from Nabeul. We use celery, no garlic and no tomato. My grandma ised to make the boulette meatballs with potato slices and lots of parsley, she ised cinnamon in the spices. 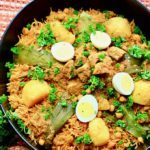 This recipe reminded me of those days. I’ve been vegetarian for over 20 years so didn’t have boulette for a while. One tip my grandma thought me is if you have a steamer and patience you can use cream of wheat. It’s exactly what fine couscous is. It takes about 2 hours to steam it and it needs to be sifted (in a tamis, large fine mesh drum sieve) by hand every 20 minutes or so and put back to until it absobs the moisture from the steam. The resulting fine couscous is so much tastier to the store bought instant couscous, there is no comparison. I wish I had the kind of time to prepare it. You are absolutely right Rony. The instant couscous we find here in the US is ok but pales in comparison to the couscous my mother and grandmother used to make. It was taking them hours and lots of patience though 😉 They also made the same meatballs with potato slices, but also squash, eggplant, celery slices.